Too often, we have students who “float” through lab exercises without making connections to the chemistry content they are learning in class. Some of these students struggle to find the meaning of a lab. When they fail to do so, they may just run through the motions, copying other students’ data and ideas, and then handing in the lab report without a second thought about the science they just witnessed. Other students may feel lab time is just for fun, and not for learning at all. As teachers, we know that each lab is intended partly to challenge students by making them discover answers to chemical phenomenon, and partly to reinforce the subjects we teach in class. So why is there such a large disconnect between labs and classroom content? The execution of the labs is an essential skill that teachers need to refine over time in order to make their labs more valuable to their students. Here are a few tips that teachers can use to help drive labs toward that ultimate goal. Whether you are a novice or an expert at this teaching technique, flipping your pre-lab isn’t a difficult process, and can prove to be very beneficial. You can create a video just by videotaping yourself in the lab using only your cellphone! 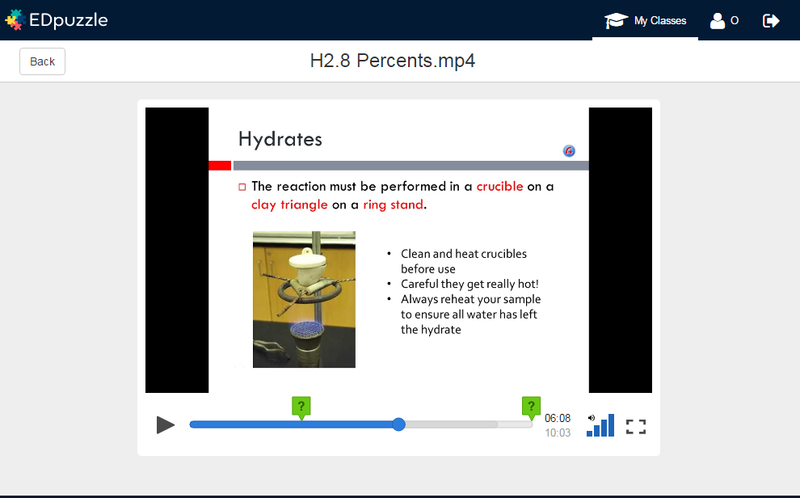 I prefer to screencast my computer using Screencast-O-Matic and voice over a PowerPoint that contains ideas and images from my lab. I upload my videos to the EDpuzzle website, a site you can use to track students watching your videos (and embed questions during the video to assess the students’ understanding). Both of these sites are free and very easy to use. Other teachers upload their videos to their personal websites or to YouTube. A flipped pre-lab could include reviewing safety rules pertaining to the lab, showing how to use equipment, practicing necessary calculations, or all of these. If the students complete this pre-lab at home, they come into class ready to work, increasing the time they can spend on the actual wet lab. The flipped pre-lab can decrease lab misconceptions and give the students a better understanding of their goal before they start the lab. In addition, flipping the pre-lab is helpful for inquiry-style labs, because the students will already know how to use the equipment and account for safety issues that may arise. If you would like to obtain more information about flipping, you could visit flippedclass.com or contact me. I would love to help you flip your pre-lab or class! Students at any level of science can have a hard time creating cohesive scientific statements. A student may be able to write an impressive essay in English or history class — but when they get to science, they often limit their writing to one small sentence that barely demonstrates their understanding of the lab. There is a lot of literature supporting the implementation of claim, evidence, and reasoning statements, not only for describing conclusions for labs, but also for demonstrations and phenomenon discussed in class. But I chose to take it a step further, and implement this strategy for writing cohesive hypothesis statements as well. My labs often start with a question that the students must try to answer. A simple example could be, “Does density depend on sample size?” Students then have to create a hypothesis using prior knowledge from previous classes or life experience to write claim, evidence, and reasoning statements. Agree or disagree with the following statement made by a student in the lab. Provide a written statement including your claim with evidence and scientific reasoning to support your claim. “The density of 50 grams of lead is greater than the density of 20 grams of lead because the 50 grams of lead has more lead particles." The “prompt” option is helpful for advanced labs where students may not know the content based on prior experience. 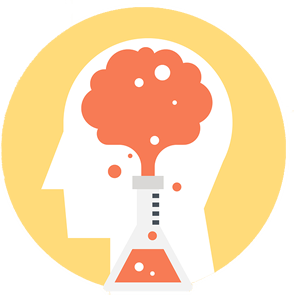 At the end of the lab, require the students to write a new claim, evidence, reasoning statement that either agrees or disagrees with their hypothesis but uses evidence from the lab. Using this approach, I have found that the writing skills of my students have strengthened immensely. Inquiry labs can be daunting and cumbersome. One strategy to make these labs more manageable is to have a class discussion before the lab starts. Give the students a larger, overarching problem that needs to be solved. In pairs or small groups, the students should come up with variables that they can test to solve the problem. A simple example could be, “What factors affect the rate of a reaction?” Students can come up with factors such as temperature, surface area, and more. Next, have a class discussion and record all of the student’s variables on the board. In some labs, it may be overwhelming for one lab group to test all of the variables that were brainstormed. Therefore, assign each lab group to test one variable from the list. At the end of the lab, students can exchange data to solve the overall problem. For example, one group can study temperature effects, while another measures surface area affects. If there are not a lot of variables, double up the lab groups and they can compare their answers at the end of the lab. The individual lab groups will have to brainstorm constants for their lab and come up with a plan of action. Once the teacher checks the plan and constants, the group can get started on a series of trials to test their assigned variable. In most cases, the students should have a pre-planned data table and a graph to show the relationship that they tested. At the end of the lab, each group should make a short, two-minute presentation to the class about the variable they tested, constants they used, and their results. The class should record that data to create a class master set of data that shows all variables and their effects. This method will reinforce the need for multiple trials of the same variable in an experiment, while not putting too much pressure on any one group to solve the overarching problem. Together as a class, they can understand the problem as a whole and witness how a group of people can work together to solve the larger problem. In my classroom, like many others, most labs are done by pairs or small groups of students. Some teachers assign roles to each student to hold them accountable for participating in the lab. Despite the effort it takes to arrange the lab and assign roles, some students can still do the bare minimum and copy other students’ work. To really tie the lab in with the classroom content and ensure that every student has motivation to understand the lab, lab quizzes can be given periodically to test student understanding. The quizzes can be short, using sample data from the lab or questions that may show up on future tests. Some quizzes may have the same questions that were in the lab, but using new numbers. Other quizzes might have questions about error analysis from a lab. You can also create a “mini lab practical” to ensure that students have proficient lab skills. In AP classes, I often give one AP question from an old exam that relates to the lab we completed. For titration labs, my lab practical may be just reading a burette and then calculating the molarity of an unknown acid. Lab quizzes should be given soon after the lab is complete, or at the latest, by the end of the unit. The bottom line is if the students know they will be individually assessed on their lab, they will most likely put more effort into understanding the lab as it is being done. Unfortunately, many students don’t find value in work that is not graded. These individual quizzes can take as little as five minutes to complete, but can be the factor that students find the most motivating in understanding the lab. It is important to conduct meaningful labs in class. If the students cannot connect the content in the labs to the content in their homework, classwork, and exams, the labs will become a waste of time and energy. The labs need to be a driving force in the classroom and something to refer to when describing questions in class. I hope you consider trying one or more of these strategies for your labs to help connect your labs to your chemistry content. If you have questions or tips for labs, please share with us on the discussion forum of the AACT website. Kristen Drury is a General, Honors, and Advanced Placement Chemistry teacher of 12 years working in the William Floyd School District on Long Island, New York. She is a New York State Master Teacher, and recipient of the 2016 Empire State Excellence in Teaching Award.